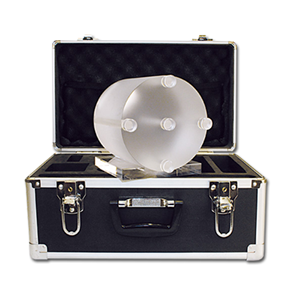 The phantom set consists of one 16 cm head phantom with 5 holes, and a 32 cm body annulus with 4 holes. Both the CT Dose Profiler and the CT Ion Chamber fit in the phantom. Body and head phantom with insert comes in a hard case with built-in trolley. The case has space for the head phantom and the body annulus, adapter plugs and a CT ionisation chamber. • Hole arrangement (head phantom) One in centre, and four around periphery, 90o apart 1 cm from the edge.